Passive compensated pressure transducer with a four arm semiconductor Wheatstone bridge circuit which produces a 100 millivolt with a 10 volt excitation. 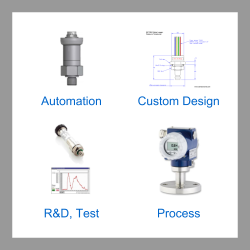 Pressure ranges from 0-100 mbar up to 0-1000 bar gauge or absolute. 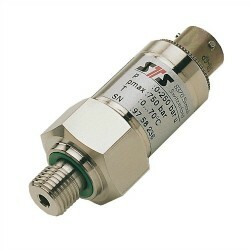 The TM strain silicon gauge pressure transducer has an all stainless steel 316L construction making it suitable for a wide range of media types. The silicon chip used in the TM sensing element has an implanted semiconductor strain gauges which offers a high mV/V sensitivity which improves signal/noise ratio and provides one of the highest possible outputs from a passive strain gauge pressure sensor. The silicon sensing chip is totally isolated from the media by an oil filled stainless steel 316L capsule with isolation membrane. The TM mV output pressure sensor is ideally suited for high frequency response applications since the output is only limited by the natural response of the silicon sensing capsule. Primarily suited to research and test applications which require high frequency response to analyse process characteristics and low power consumption for battery powered data logging in remote locations. Due to the lack of active electronics and signal conditioning circuitry the TM strain silicon gauge pressure transducer also has a relatively high operating temperature range of 150 degC (302 degF). The output signal is produced by causing an imbalance of impedance in the 4 arm wheatstone bridge circuit of silicon strain gauges when pressure is applied. The output is therefore proportional to the excitation voltage applied across the bridge. A regulated 10Vdc supply voltage will generate a sensitivity of 10mV/V for all standard ranges above 2.5 bar. Since the output is ratiometric to supply voltage, the sensor must be connected to a regulated supply if measuring the output signal independently of supply. Send us your enquiry for TM Silicon Strain Gauge Pressure Transducer to get assistance with this product type.